While the shape and colour of flowers may attract immediate attention, it is the scents, intangible and subtle, that remain in one's memory long after the flowers have faded. Life is a garden when you fill it with fragrant flowers and foliage. Scent, whether bold, delicate or subtle, can depend on time of day, temperature, sun and wind, and may be released freely and drift over a great distance, or may need to be touched or crushed to release the aroma. Plant near entertainment areas the nostalgic scented violet, mauve and white flowered yesterday-today-and-tomorrow (Brunfelsia pauciflora), white flowered Mexican orange blossom (Choisya ternata) with plain green leaves, yellow-leafed Choisya 'Sundance', and the cream bell-shaped flowers of September bells (Rothmannia globosa). 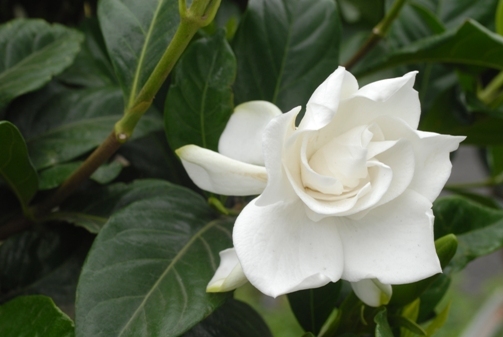 Dwarf Gardenia augusta 'Radicans', with shiny foliage and white fragrant double blooms, is excellent for pots on semi-shaded patios and decks. Plant around a garden bench in a sheltered spot where scents linger, port wine magnolia (Michelia figo), whose rather insignificant flowers have an intriguing banana scent, and evergreen Murraya paniculata with richly scented clusters of white flowers. 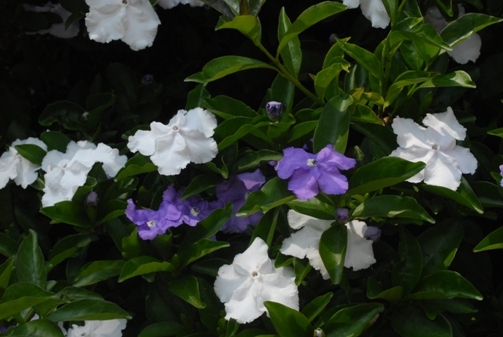 This murraya can also be grown as a rounded shrub or clipped as a 'lollipop' standard. Plant alongside paths small aromatic shrubs that release their scent when the plants are touched or brushed against, such as lavender and rosemary. Another low growing plant that has a lavender scent is lavender cotton (Santolina chamaecyparissus) with finely cut leaves of silvery grey and tiny pom-pom yellow flowers in summer. Plants with silver-grey foliage also have value at night, as they show up in moonlight. For something a little different, grow the indigenous wild rosemary (Eriocephalus africanus) with grey aromatic foliage and tiny white flowers, and the Australian mint bush (Prostanthera nivea), a compact shrub with aromatic foliage and white or lilac flowers in early summer. Plant outside a window and let the delicate scent of the waxy white flowers of mock orange (Philadelphus coronarius), and the honey-scented little trumpet flowers of Freylinia lanceolata drift inside.